Why stock market all-time highs may not matter. As it stands right now the S&P 500 is less than 2% from hitting all time highs. The tech heavy Nasdaq 100 is even closer with less than 1.5% to go. This usually builds much anticipation from investors and financial media. If one were to look at the gains on the year for the S&P 500 that may build even more bullish excitement. The S&P 500 is higher by over 15% already this year and it’s only the 4th month. The Nasdaq 100 broke the 20% level on Friday which all is very impressive. 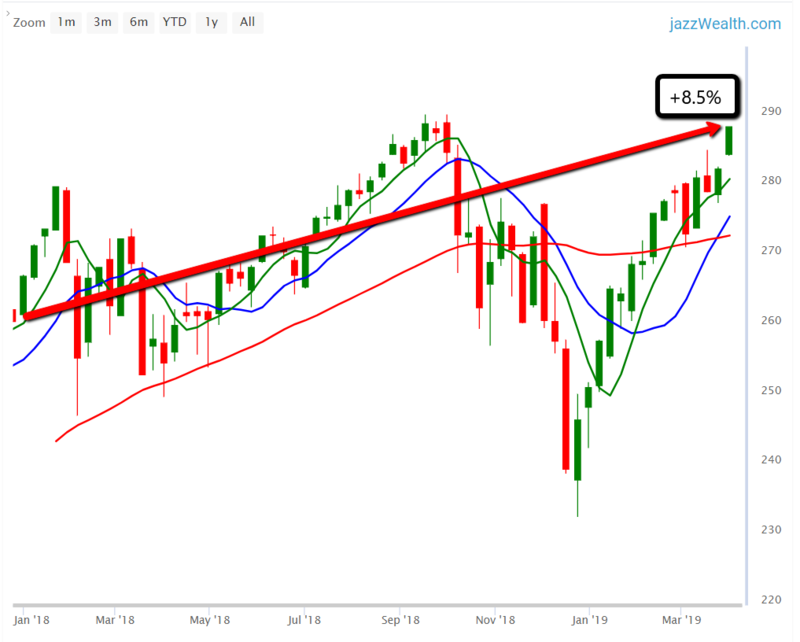 Here’s the issue with the markets potentially hitting all time highs...again. Not everyone can celebrate together! Some will still be disappointed, and some will be happy but still nervous. If you invested in the S&P 500 last January you would be sitting with a total gain of around 8.5%. While that is nothing to be ashamed of, what are you seeing and hearing right now about the overall markets? You keep hearing all this talk of double digit gains and you don’t have that. In fact, if you invested in early February 2018 then you have a gain of only 5%. If you happened to start investing in late December then that would be the only group of investors that are truly excited about maybe hitting new highs. Another way to think of the emotion felt? In December of last year everyone who invested anytime in the last 23 months had a loss. Now imagine the emotion of such a large group of investors. Sure, they see that markets are calm and headed for highs now, but not everyone has the same, or even similar gains. For this reason you have different emotions. Some will be using the all time highs to exit where they started and others are still trying to figure out why they don’t have double digit gains that everyone is talking about. All this creates different emotions which cause investors to do crazy things. Our job here at Jazz Wealth is to make sure our investors are invested correctly during all the noise. We also love to teach and educate so our clients are always one step ahead of the emotion. First quarter results, Second quarter stats. The first quarter of 2019 is officially over and goes down as the best quarter since 2009. As far as first quarters go it ranks as the best since 1998. 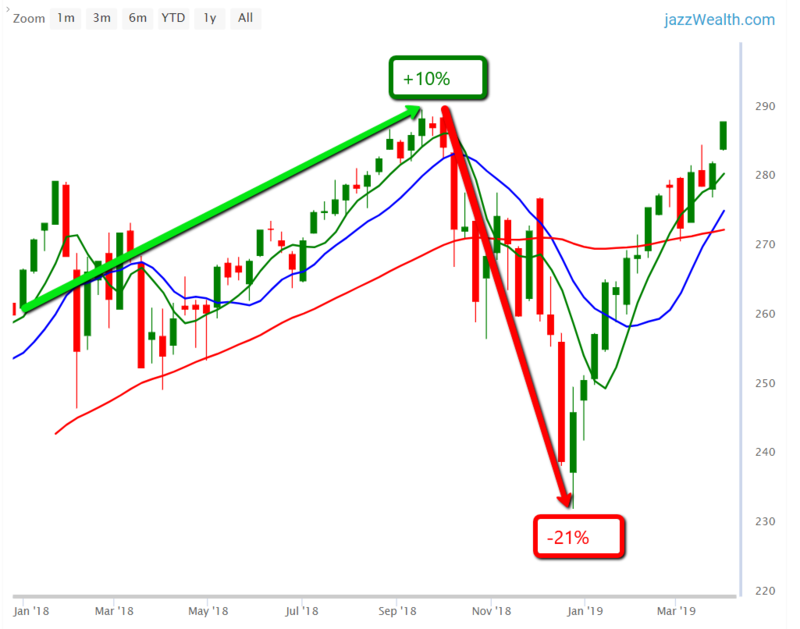 You may remember that in just the first two days of the year (Jan 2-3) the S&P 500 sold off 2% which was something had only happened five other times in the S&P 500’s 90+ year history. After the December selloff, and the weak start to the year many investors did not have a favorable outlook for 2019. Retail investors pulled $44 billion from their 401k investments to sit on the sidelines and, by now are surely regretting it. For the first quarter, the Nasdaq 100 (NASDAQ: QQQ) comes in as the best performer with a gain of 16.6%, and the worst performing index (which is still not so bad) is the Dow Jones Industrial Average (NYSE: DIA) with a gain of 11.12%. Many investors give the Dow a pass since over 20% of the gains that the index missed out on are due to Boeing (NYSE: BA) and the grounding of their 737 Max jets. Sector wise, big tech (NYSE: XLK) wins out with a gain of almost 20% for the quarter. Healthcare continues to be the under performer though 61% of all analysts that cover the sector are bullish with buy ratings. Financials are also at the bottom of the list with gains of only 8%. Banks continue to shake off the pounding they took in the last two weeks from the Federal Reserve's decision to leave rates unchanged, likely for the rest of the year. Just for fun, if you want to look around the world for the best performing markets you would come across China. But we keep hearing that China is falling apart right? Almost every market in China is at the top of the best performers list. China (NASDAQ: MCHI) currently ranks at the top with a gain of 18.64%. Hong Kong (NYSE: EWH) sits at the top as well will 16.13% gains on the year. Another area where the media may have you concerned is in the UK. There is no doubt that Brexit is a mess and seems to have no real resolution in sight but that hasn't stopped them from a 12.47% gain on the year. Surely they could have enjoyed more growth if there wasn’t the concern of the final decision on Brexit. So what can we expect going forward? Well, it depends on what data you want to use. If you look back over the last 10 years the second quarter offers the lowest odds of being a positive quarter. Only 60% of the time it finished positive with an average gain of 1.4%. If you look back over the life of the markets you would find slightly better odds of 62% of the time Q2 being positive after a positive Q1. Average gains in the second quarter when it does finish positive is 1.9%. FYI: Historically the third quarter is the weakest of all. 5 year rule on the Roth IRA. Ok, I'll keep this one simple. Last year at jazz wealth we had a total of 1488 scheduled calls. Some calls turned into business, some turned into a 15 minute education session, and others turned into nothing. If you are thinking of working with us here at jazz wealth or just have some questions you can always schedule a call. We're happy to help! As you may know, at jazz wealth we are all kinds of geeky and love the stats of everything from retirement investing to general market facts. One of the things we track is the types of questions we get and how often they are asked. One frequent question people had was about the 5 year rule on a Roth IRA. One of the reasons we like working with the Roth IRA for most clients here at jazz wealth (aside from the tax free growth) is that you can take out your contributions anytime you like with no tax or penalty. For example, let's say you took added $1,000 last year and then contributed $2,000 this year. For some reason, you need to take out $1000 this year. Could be that you ran into some financial troubles or emergency and had no other options. Since you made a total of $3,000 in contributions you could take that $1,000 out and suffer no penalty or tax unlike the other types of IRA's. The reason is simple, you contributed that money after tax meaning the IRS has already been paid. For this reason, since your tax obligation has already been met, the IRS is ok with this transaction. Many people mistakenly think you must wait 5 years before taking out any contributions and that is simply not the case. When a client at jazz wealth needs to take a withdrawal we let them know how much they can take out before incurring any penalty or tax. The 5 year rule refers to those that are close to the qualified distribution age of 59.5. This is the age you can take out any money in your Roth IRA (growth and contributions) without any tax or penalty. The catch here is that when you turn 59.5, if you want to take out any growth you must have had the Roth for at least 5 years leading up to the qualified withdrawal. For example, let's say you open a Roth IRA this year and you are 57 year of age. When you turn 59.5 (or anytime prior to this) you can certainly take out your contributions BUT you would need to wait 5 years until you could touch the growth. In this example, the year in which you turn 62 would be the first year you could withdrawal contributions as well as growth with no tax or penalty. Jazz wealth is a teaching firm. Not only do we manage clients investments for them using our expense free funds but we also teach on a weekly basis in live classes as well as our recorded sessions that are always available on demand. If you want to work with an SEC registered, Fiduciary advisor keep us in mind here at jazz wealth. Jazz Wealth is an SEC registered, fiduciary advisory firm with an educational kicker. We teach our clients and the public on general, and retirement investing. Jazz Wealth Managers, Inc. (CRD #282807 / SEC# 801-113840) is registered as an SEC registered investment advisory firm. Past performance is not a guarantee of future results. Any historical returns, expected returns, or probability projections may not reflect actual future performance. The material contained herein has been prepared from sources and data we believe to be reliable but we make no guarantee as to its accuracy or completeness. The material is published solely for informational purposes and is not an offer to buy or sell or solicitation of an offer to buy or sell any security or investment product. This material is not to be construed as providing investment services in any jurisdiction where such offers or solicitation would be illegal. You should be aware that investments can fluctuate in price, value and/or income, and you may get back less than you invested. Investments or investment services mentioned may not be suitable for you, and if you have any doubts, you should seek advice from your investment advisor representative. © Copyright 2019 Jazz Wealth Managers, Inc.